I found a book treasure when I returned to the ACE office after a long business trip. It was given to the ACE team from two of the leaders* of Oakland International High School (OIHS) which hosts an ACE Learning Center. OIHS is dedicated to serving Oakland’s newcomer youth. 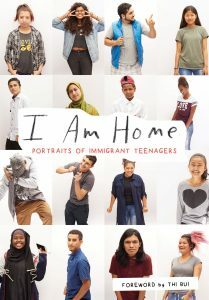 The book “I Am Home, Portraits of Immigrant Teenagers” is a collection of personal stories defining what is home by teens attending OIHS. Their memories are of what their former homes were like from refugee camps to villages to cities, and what home means to them now that they reside in the Bay Area. These students are learning how to live in a new country, along with a new language and culture. They experience the positive and negative as they look for safety, friendship, love and a way forward. Safety and family are huge themes for these students. In reading these portraits I am reminded of a quote by John Dewey at the beginning of the book “Educated” by Tara Westover. I had to google Dewey and learned he was a mid-20th century education reformer and philosopher, and his idea of education as a continuing process is something to which these students might relate. Their stories are about change, something we all experience, but these students’ change is continent-sized as they moved from one country or continent to the U.S. The portraits are full of describing the time spent studying, working and trying out new opportunities. Of missing parts of their family, parts of their culture. The sounds, smells, flowers, yards, pets, food, fresh air, hugs, fun time, cows, lost friends, living a different life style. Some want to return to their homelands. Some can’t. But all are going to school. All are getting an education at OIHS. All are reconstructing their experiences of education in the classroom and in life. OIHS is a key part of guiding these continuing reconstructions of experience. We at ACE are honored that we can help. *Thank you Sailaja Suresh, Director, OIHS Learning Lab, and Carmelita Welsh Reyes, Co-Principal, OIHS, and all the OIHS students that signed their names and thanks in the book. Wow. What a treasure. Purchase “I Am Home” on Amazon . All proceeds will go OIHS.